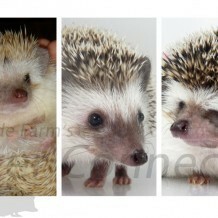 Most breeders recommend selecting a fully weaned hedgehog that is between six- and twelve-weeks old. Babies are fully weaned when they can eat and drink on their own, without their mother providing any of their nutrition. Human nature makes us want to select the smallest, cutest baby possible, but this is not a good option for the safety and well-being of the animal. Due to their size and feeding requirements, breeders generally have very little success hand-rearing orphaned babies. For this reason, breeders do not sell newborn hedgehogs. Instead, babies are left with their mother until weaning age. Babies weaned too soon, or those that are too small, are too delicate to undergo shipping stresses (change in environments). They are also likely to have significantly more problems than babies that are slightly older and more independent. Hedgehog owners should expect babies to go through an almost continual quilling process until they are approximately twelve weeks old. This natural process can be uncomfortable for the young hedgehog, and can make transitioning to a new home even more stressful. If the breeder or seller provides thorough care and handling instructions, older animals (five months or older) may still make good pets. Older animals typically require more patience from new owners because the bonding process is usually longer than with young hedgehogs.